This weekend, I had the profound honor to spend the weekend at Fort Hood, the US Army Post in Killeen, Texas. 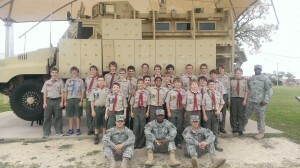 Troop 845, including my son and I, had the amazing opportunity to spend a weekend with several of our country’s finest soldiers. We arrived at Fort Hood’s visitor center around 9AM, and introduced ourselves to the Sergeants who would be our hosts from the 13th Sustainment Command. It was amazing how quickly we bonded, including several of the boys getting nicknames from our hosts that will likely stick with many. The boys received some drill & ceremonies (marching) instruction that really helped immerse themselves in the weekend and the “Army way.” Along the way, it also gave some of our youth leaders some new perspectives on leadership and team organization. The boys worked an obstacle course, including climbing walls, rope walls, etc. It was awesome to see them come together to help each over the obstacles, reinforce safety, and build confidence. We toured several generations of mechanized infantry from tanks to trucks to vehicles that defy description. Inside, we toured the museum of 1st Cavalry, including a sobering wall of Medal of Honor recipients, whose stories really impacted our Scouts (as we discussed later) on how ‘regular people’ can do amazing things. We toured the stables of our country’s last remaining horse-Cavalry unit. You could just see the interest by the boys as they looked at a part of our Army’s tradition that reaches back over 100 years. We tented in a recreational park, which happened to be hosting an amazing Christmas lights show. The next morning, after breaking down the tents, the boys did some Army Physical Readiness Training (exercises). [Remember, keep reading as a young-man, not a parent]. The boys had a great time, and the sense of accomplishment and pride-of-perseverance showed on many of their faces. Later, we enjoyed MREs (meals ready to eat) and then had the opportunity to see how soldiers train for combat, using laser simulators and such. We found a piece of grass and shade, and worshiped our God by discussing the all of the equipment that we had been shown in the US Army, compared with the Armor of God (Ephesians 6). And finally, we closed out our visit with a very heartfelt discussion of the Scout Oath & Law, compared with the Army Values (LDRSHIP). By the end of the weekend, the term “soldiers” wasn’t a reference to the anonymous characters found in video games, but we knew them as men, fathers, husbands, selfless-servants who carry the honor of our country in their hearts and on their backs. Its hard to remember a time when I was more proud or grateful of our soldiers, as they personally and individually impacted the very special group of Scouts. I will never see a Serviceman the same way again, and I cannot imagine that our Scouts will either.